1. Engineered with Technologies: 2.0 channel speakers with dual 25W amplifier forms the base for the SoundPhase technology that improves the sound volume and clarity. 2. Select Your Connecting Modes: Everything you need for a wired or wireless soundbar is in the box. Set them up and enjoy the sound from your smartphones, laptops, TVs, or even USB sticks. 3. All in the Control: Adjust the treble and bass as you prefer and switch modes as you like with the infrared remote control, wherever you are sitting or lying. 4. Feel the Surround Soundstage: Meticulously designed speakers expand the sound waves to every corner of your room. Close your eyes and listening to the whispers near your ears. ♫ dual 25 watts 2.0 Channel Surround Soundbar ♫ With dual 25 watts speakers and DSP amplifier, our 2.0 channel Home Theatre System provides you the cinematic audio experience from the living room to the bathroom. ♫ Multiple Connecting Options ♫ Streams every note of your fave songs via AUX/OPT/RCA/USB modes, or through the enhanced Bluetooth modular integrated into our sound bar anytime, anywhere. ♫ Easy to Operate ♫ Take full control of your TV speaker sitting on the sofa with the infrared remote control. Colored LED indicator intuitively tells you what mode your soundbar is in. 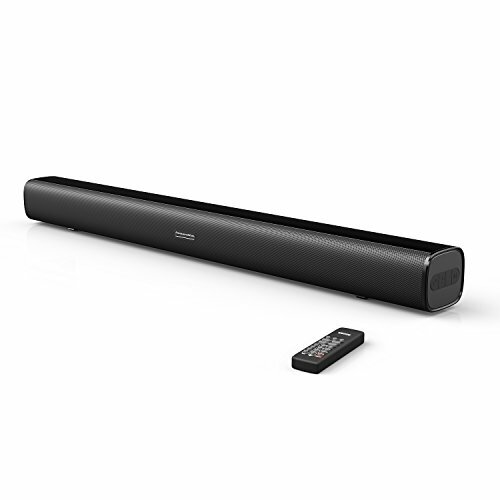 ♫ Bigger Sound in the 29.5-inch Soundbar ♫ The slim wireless soundbar features sleek body and perforated wrap-around grille, boosts the sound from TV and blends well with your home decor. ♫ Less Effort, Better Sound ♫ Set up our surround sound bar within minutes, and start to enjoy the unrivaled performance when watching movies, listening to songs, and playing video games.